Our Favorite league is starting today and excitement can’t be any less. As every year, I have , registered in the Fantasy Premier League, an official fantasy League on Barclays Premier League. a. Soldado : I am big fan of his and have a high expectations. 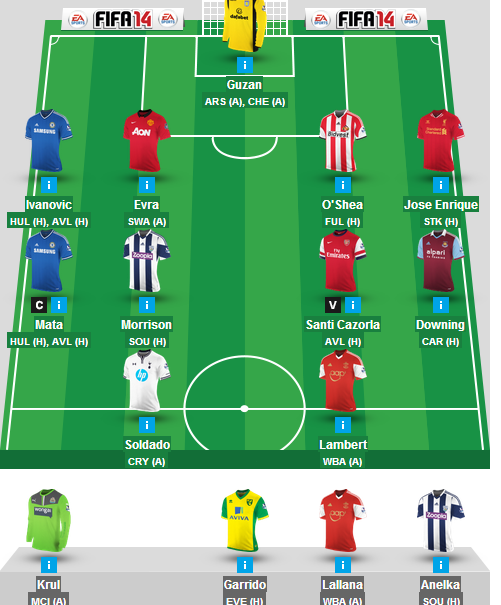 b. Lambert: Fresh from goal with England, was star of man of my last season’s FPL. c. Anelka : There will goals. Watch this space. a. Mata (c) & Cazorola : There will be fireworks I am sure. Mata is straight forward caption because of High expectations and 2 fixtures in the matchday. b. Morrison , Downing and Lallana : I expect them to be consistent. a. Inanovic, Evra and Enrique should give points every week. b. O’Shea and Garrido are first name in their respective team sheets. There will be changes after the 1st wild card after end of transfers . Guzan and Krul does not seem like expert pick. What DO you think About my predictions ? ?